What is your perfect trip? Having no-wind alternatives such as SUPs, Catamaran sailing and mountain biking, it comes pretty close to the idea of perfection. 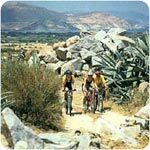 Naxos is a mountain bike haven, with innumerable mountains, dirt roads and mule tracks making the area a dream for mountain biking. You will find everything from easy wide trails to single tracks, with steep downhills, sandy sections and some backbreaking uphills. The routes are endless. The combination of mountains, valleys and beaches will take your breath away. You can follow our guidelines or let your instinct lead you. Just let us know if you require bikes. When the weather is calm a perfect way to spend a morning, or entire day, is to rent a kayak and paddle in the beautiful water of Naxos bay or explore and find your own private beaches. All our boats come equipped with backrests for more comfort, paddle leashes and life jackets for safety. 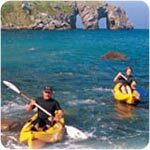 Sea Kayaks are made of polyethylene and are very durable and stable. Together with local guides you can discover stone villages, medieval tower houses, deserted monasteries and the impressive mountain landscapes of Naxos. 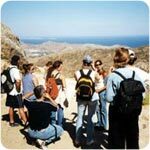 Walk through valleys, on old mule-paths, forest trails and through narrow paths across rocky slopes. Enjoy the absolute stillness at the summit of Mount Zeus, the Agean`s highest peak. Naxos is located in the center of the Aegean, making it an ideal base from which you can get to know its neighbouring islands. 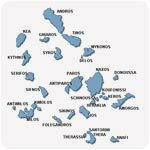 Delos and Myconos, Paros, Santorini, Amorgos and Small Cycladic islands. You can get to any of these islands in a couple of hours ferry ride.